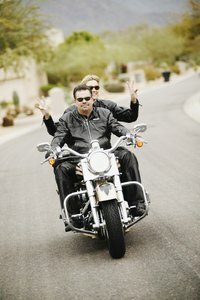 If you're looking for an excuse to take your motorcycle out for a spin organize a scavenger hunt with a group of friends. No need to collect items on this hunt seeing as how storing the goods someplace is difficult. Instead grab your backpack and digital camera and snap photos of everything on your scavenger list. Give items varying points dependent upon the difficulty of "retrieving" them and reward top players. Allot for periods of up to a month or more for really challenging scavenger hunts, and for hunts that require traveling to distant locations. Pack your camera in your backpack and head for the open road. The goal of this hunt is to get as many pictures as possible of different modes of transportation. The list can be made up of everything from four wheeled vehicles to animals to parachutes and submarines--if it is a form of transportation it counts. Players earn points for each item and the points are determined by how challenging it is to find a particular item. This motorcycle scavenger hunt should span a longer period of time considering participants are expected to travel out of their immediate region to points of interest. Make sure you have your camera in your backpack and take individual pictures at all stops as proof. Government buildings, memorials, post offices, statues, historical plaques, relevant sculptures, hospitals, gardens, the mayor's office, the governor's mansion, parks and identifiable recognizable public markers should compile a sufficient list. For added fun require players to take a stuffed animal with them that must be photographed in each location. A hunt based on variety provides fun in its diversity. A list for this trip ranges from objects to animals, buildings to bridges and colors to numbers. Roman numerals as well as standard numbers from one to ten, theme park entrances, biker-friendly bars, restaurants, mechanics, hair salons and retail shops and license plates from different states all offer a combination of images to be found and can be captured in a photograph. Toss in a string of donut or sweet treat shops for a sub-category to enrich the mix.